We are involved in offering a contemporary range of Printed Environment Friendly Jute Bags. 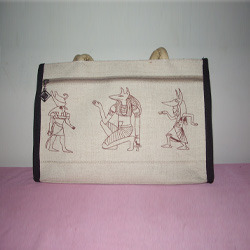 These bags are attractive, stylish & trendy and are available in various designs and sizes. Furthermore, these bags are extremely durable and have the ideal size to carry essential items in a handy manner. Available with soft handle, the bags makes a perfect style statement. We are looking for queries from South India. We, "Spectrum", establish in 2006 entrant in this domain, we are one of the leading names engaged in manufacturing, wholesaling and distributing a wide range of Bags and Stationery Products. Our product line encompasses Fancy Jute Bags, Cotton Bags, Nylon Bags, Jute & Cotton Files & Folders. In addition to these, we also offer Files and Folders, College Bags, Laptop Bags, Executive Bags etc. Designed and developed using high-grade raw material, the entire range of these products is in conformation with the industrial norms and standards. Available in various sizes, colors and shapes, these products are highly demanded by clients across the national market. Our robust manufacturing unit, together with our team of diligent professionals, has enabled us to successfully cater to the bulk requirements of our clients. Assuring a flawless delivery, our quality controllers strictly test the entire process right from procurement of the raw material to the final dispatch. Furthermore, we offer customized packaging solutions to our clients in accordance with their specific requirements. To avoid hassles in the monetary transactions, we accept payment in easy modes such as Cash and Cheque.